Alterna Hemp Organic Straight Conditioner - Designed to optimize and lock in moisture levels for improved strength and elasticity. Hair is transformed, becoming soft, smooth and shiny. Hemp seed oil restores elasticity, manageability and shine. Ideal for dry, frizzy and unmanageable hair. Nutrient activating enzymes prevent damage caused by sunlight and pollutants. Ideal for daily use. 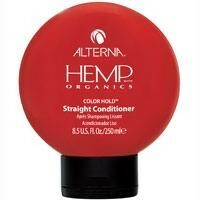 Replaces Alterna Hemp Straight Conditioner. 1 LITER 32oz, 1 8.5 oz in stock.